For the first time, the BBC has pulled together data that shows not just where charging points are found but also how many electric vehicles are registered in that area too. Data on charging locations was sourced from the Open Charge Map website, while the number of electric cars in an area was sourced from the Driver and Vehicle Licensing Agency (DVLA). As with all data, there are some caveats. Open Charge Map does not include every charge point as they are popping up all the time and the location points in its dataset are crowd-sourced by electric car users. And while the DVLA data shows where electric cars have been registered, some areas have anomalies. This is usually when a fleet of electric vehicles - milk floats, for example - have been registered. But this is still a way of getting a strong sense of how robust the infrastructure for electric vehicles is right across the county, and it reveals some places are much better prepared for an electric future than others. According to our research, by the end of January 2019 there are 7,044 places where you can charge an electric vehicle, but out of 385 local authorities, more than a third have only ten (or even fewer) charging stations. Milton Keynes has the most while Barrow-in-Furness is one of six councils with none at all. There's a lot of data and you can look at it in a number of different ways, but to start with, the BBC has created a league table of all the local authorities. At the top, those with more than enough charging points for the number of cars registered to that area. Down the bottom, those who have fallen behind. A large number of these points are installed privately and then local authorities have a responsibility to install more to help the government meet its ambitious targets. If you want to do a deep dive into the data yourself then you can find it all here. Interestingly, there is no obvious correlation between the type of council and where they are in our table. So urban Manchester does well while urban Birmingham does badly. Cornwall and Devon perform well but Dorset doesn't. Coventry is another city that does well and our research might give us one reason why. The government has a £2.5m fund to help councils build more public charging points and Coventry is the only council in the Midlands that has applied for this cash. Ambitions for electric vehicles can be caught in a chicken and egg situation. New owners worry they won't find anywhere to charge their electric cars when out and about and that in turn limits sales. 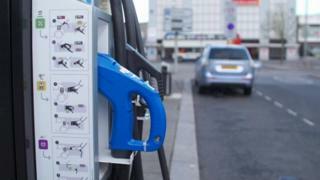 If demand is lower than expected, councils won't spend the money to build new charging stations. But our new league table shows, for the first time, the councils that are charging forward and the ones that have run out of juice.